School is back in session and the homework assignments are starting to roll in. We often talk to our clients with children about the homework “process” and the fact that it can present real challenges, not just for the parents struggling to help, but also for kids who might be finding it hard to find a quiet place to concentrate. This is particularly true for households with multiple kids at various grade levels. One way to help make homework a much easier experience for both parents and kids is to create a homework area in your home that is both functional and fun. Creating a space that fosters learning is key as kids function better when they have a designated area to work in that is set up specifically for them. The space needs to be functional but it also has to be fun and inviting — they are kids after all! You want ample space for your children to be able to spread out their books, papers, supplies, etc., but they will also need a system to stay organized. If there is more than one child, there needs to be a way for each child to keep their work separate and to limit distractions. Proper lighting is essential, as is the workspace, seating and storage. We know from experience, though, that fun and colorful design does not have to be (and should not be) sacrificed in the name of function. You can design a fabulous and functional space for your children that they enjoy spending time in while they’re being productive and focused on their studies. 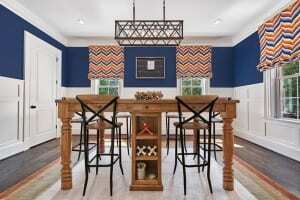 We recently completed a homework room project for a busy professional couple who have four children. We chose a room that was on the first floor and close enough to the kitchen to allow easy monitoring by mom and dad, but far enough away from other distractions to keep the kids focused. The clients’ home has a rustic chic style, so we wanted to coordinate the design of this room with that overall theme, but still keep the children specifically in mind. The first thing we did was have tall board and batten wainscoting built and painted pure white which added the feel of height to the room and made it appear even larger. For the centerpiece of design, we had a large “homework” table custom built out of reclaimed wood taken from old barns located on local farms. The table is big enough for 6 people to each have a large workspace, and each person also has their own drawer to hold supplies. In addition, the table has centrally located shelves to store things that might be used by all 4 children, such as paper, pencils, pens, etc. We also installed a separate drop-down secretary style desk in a corner of the room that provides another work space as well as a hanging file drawer where each child can keep school papers throughout the year. 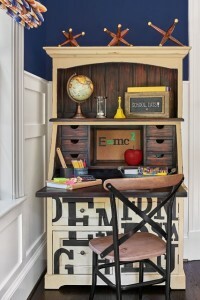 We had the desk hand-painted with letters to make it a little more informal and add some whimsy. One of our key challenges with this room was to find a lighting solution that created a lot of light in a room that got a small amount of natural light, yet maintained the rustic chic style of the room. We solved that issue by first installing a large reclaimed wood-look chandelier with vintage bulbs centered over the custom table. Then, we added recessed lights around the perimeter of the room. The size and look of the central lighting fixture draws you in and helps consolidate the design, while the recessed lights provide ample brightness. 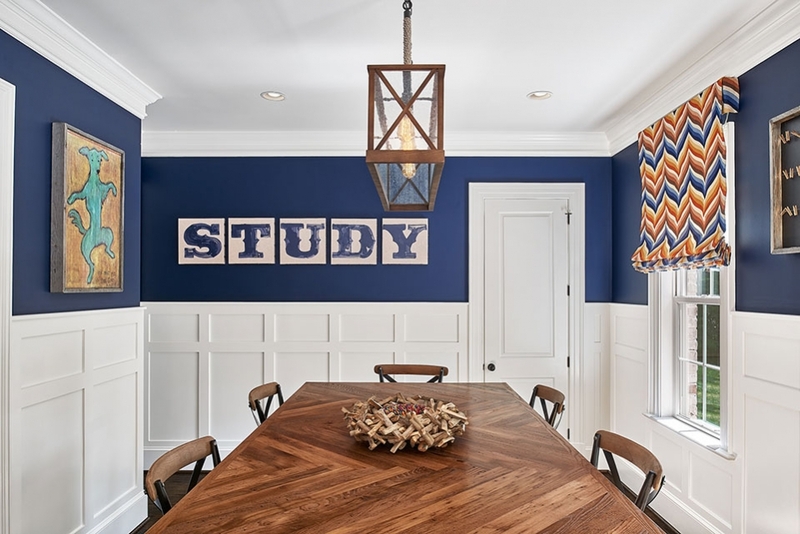 The colorful window treatments we installed are reminiscent of a crayon box, and we added other inspirational touches in the form of wall art, a memory board that art projects and school work can be pinned to, and hand-painted “STUDY” letters on the wall. Last, we added more storage in the homework room by redesigning an existing closet with shelves, lighting and bins. For more information on how Grace Thomas Designs can help you create a functional and fabulous homework space, contact us today!